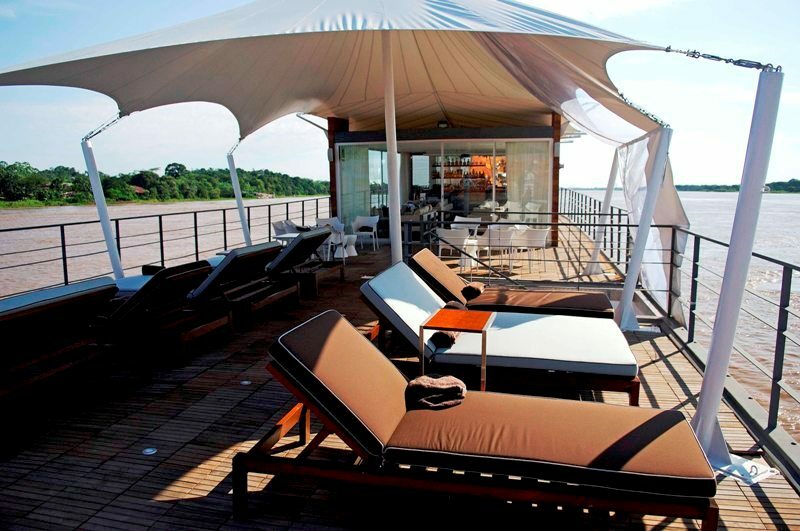 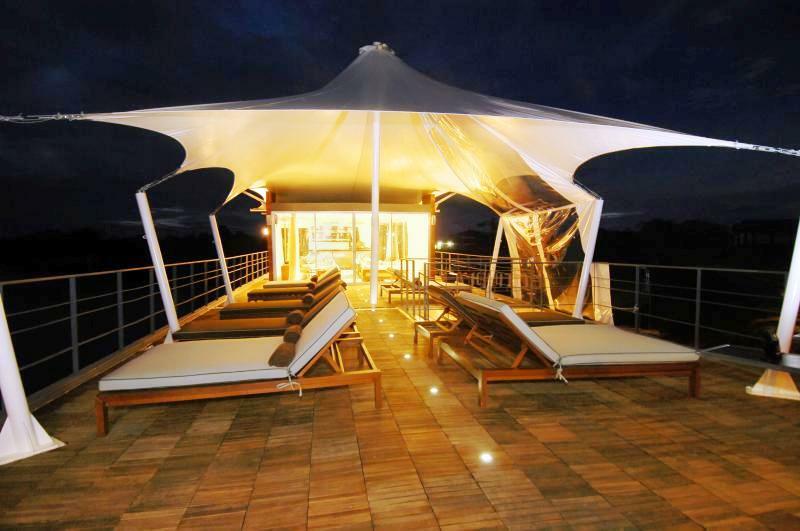 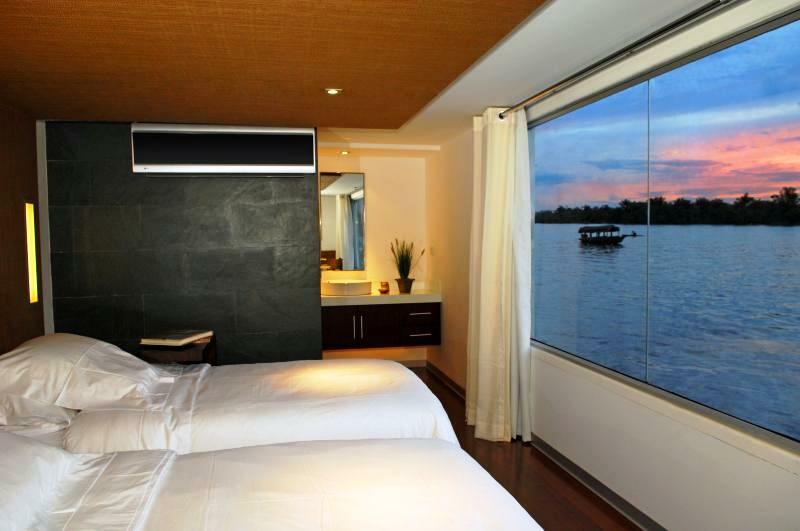 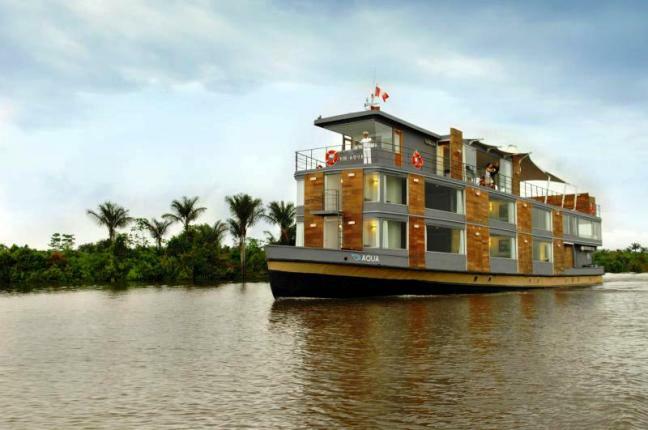 Luxury yacht AQUA is a Custom built 2007 motor vessel that is based in the amazing area of Iquitos, Peru, South America. 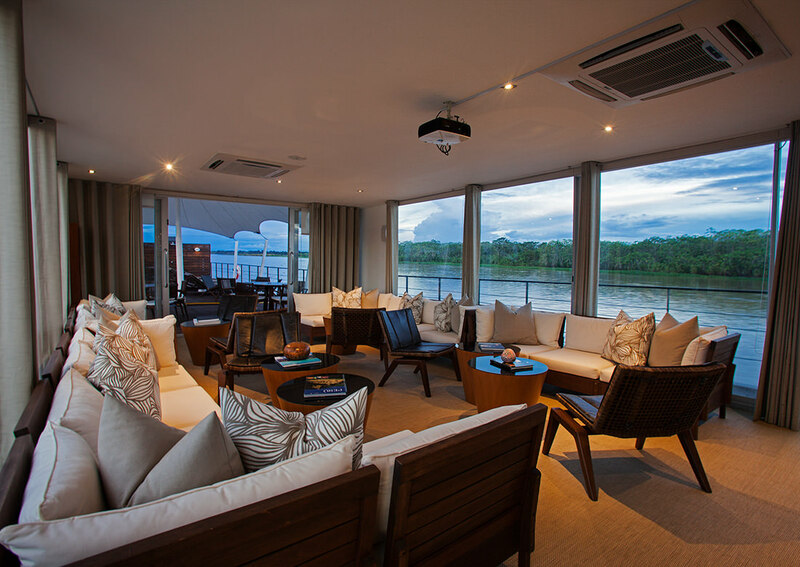 She can accommodate 24 guests and her caring crew of 14 is complemented by three skilled guides. 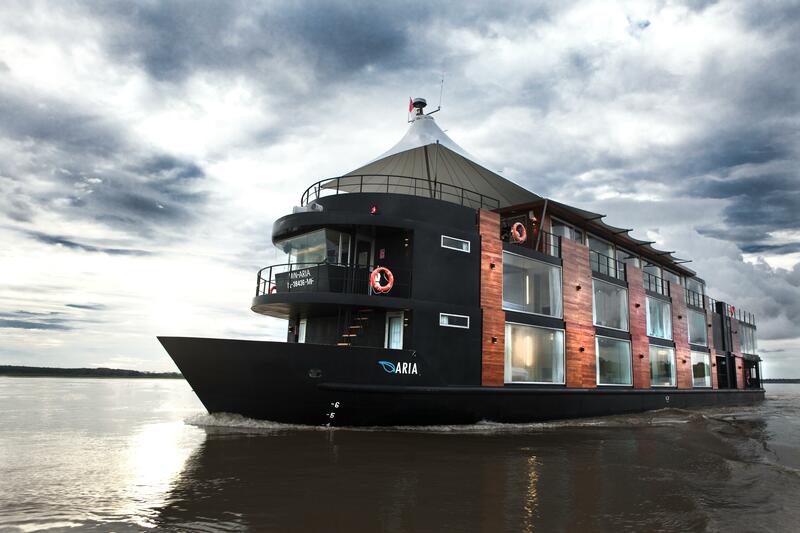 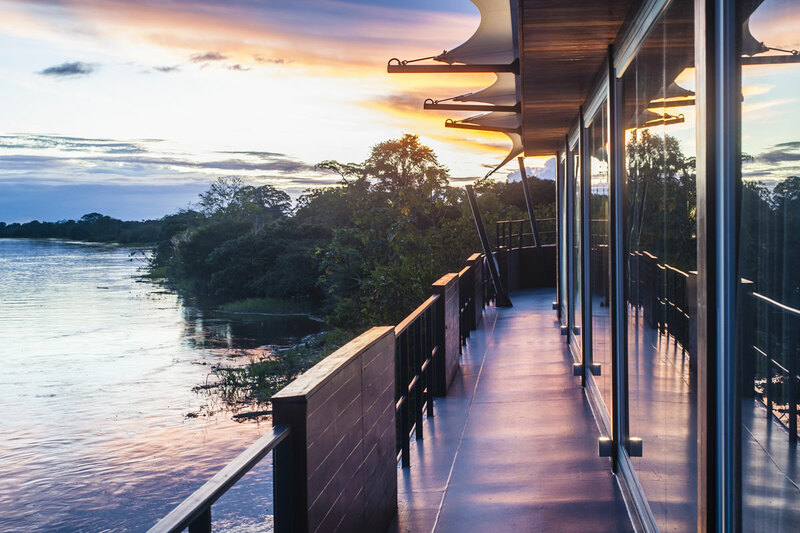 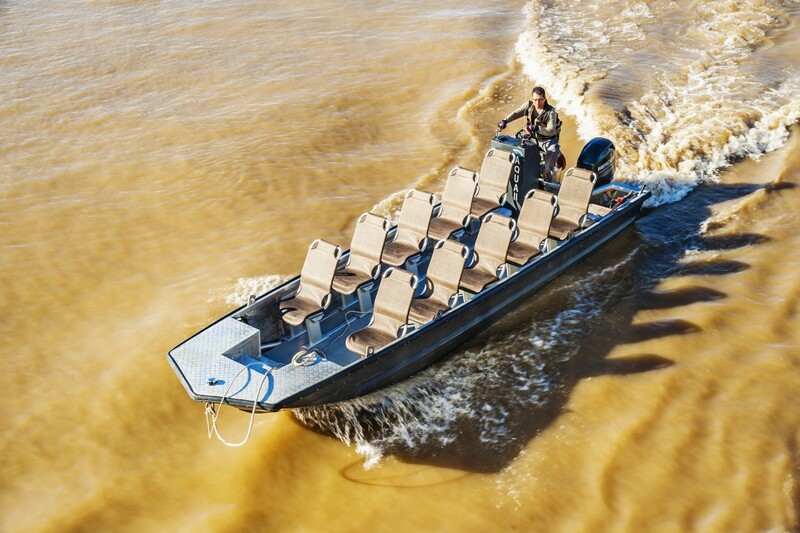 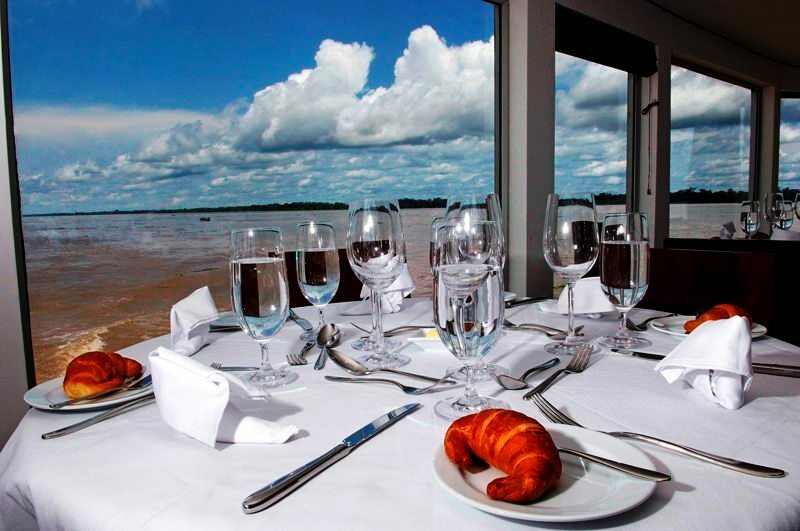 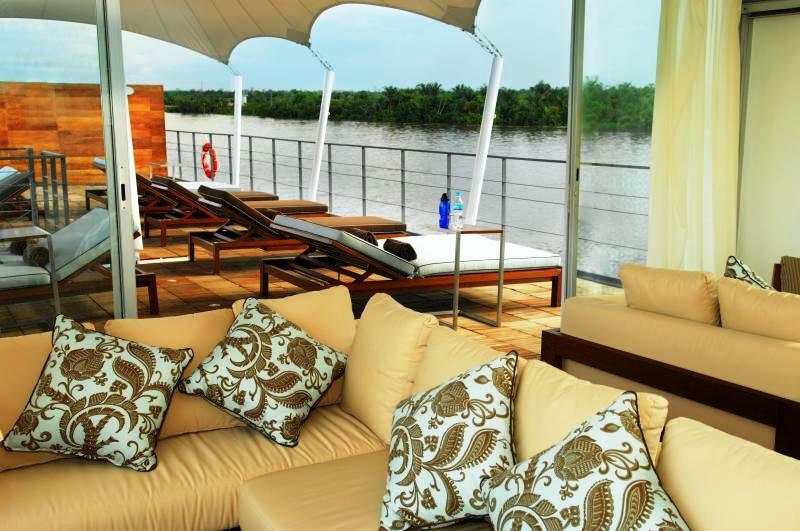 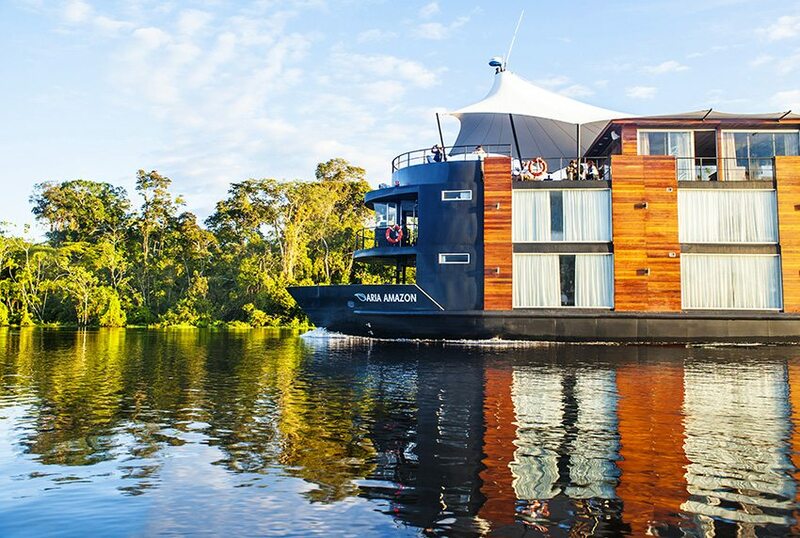 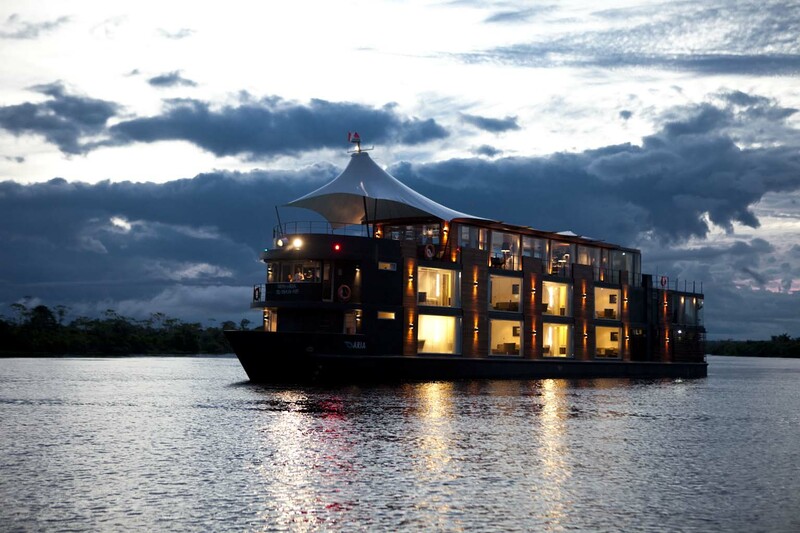 A privilege few guests will ever have the opportunity to charter M/V AQUA in a voyage of a lifetime, sailing the earth’s mightiest river — the Amazon. 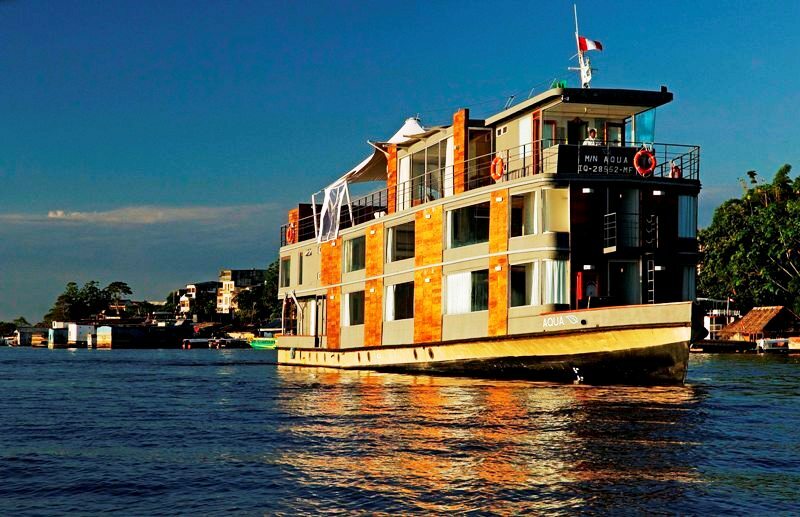 The first luxury vessel in the region, the motor vessel Aqua caters to the most discerning and adventurous of world travelers, providing an unforgettable journey into some of the worlds most unique areas. 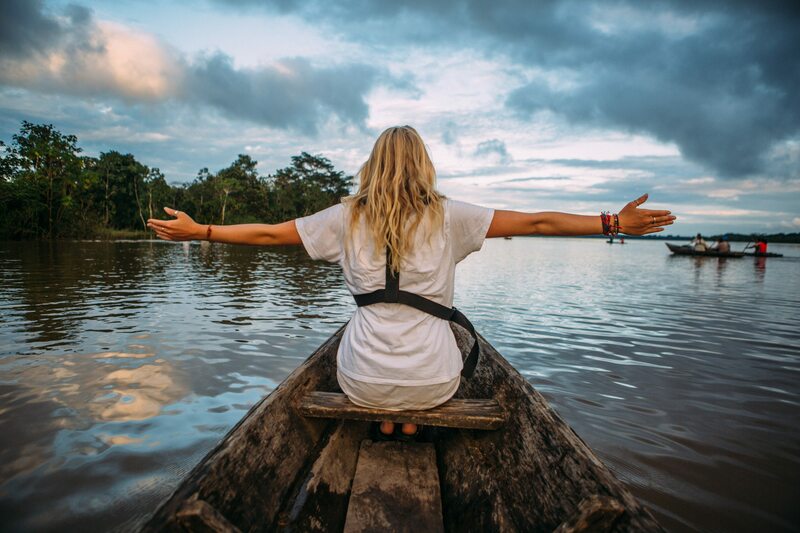 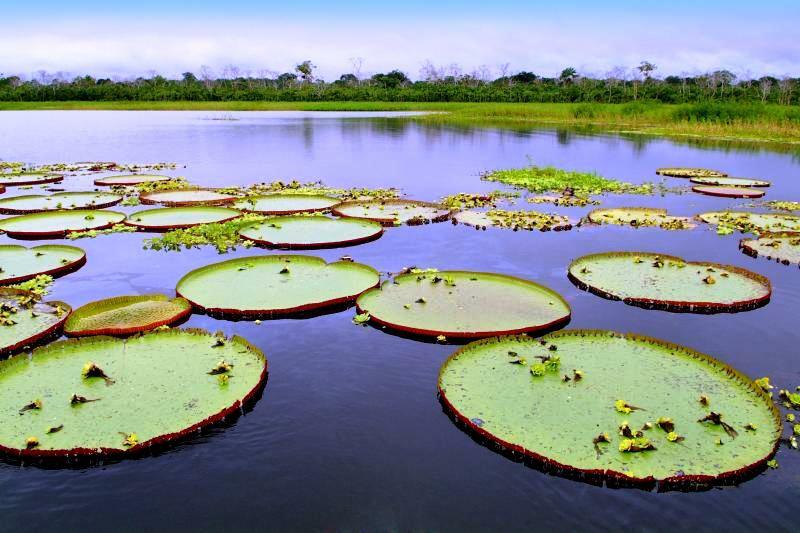 You will start your journey through the wild Amazon region in Iquitos, so remote that it can be reached only by air or water (just a one hour and 40 minute flight from Lima). 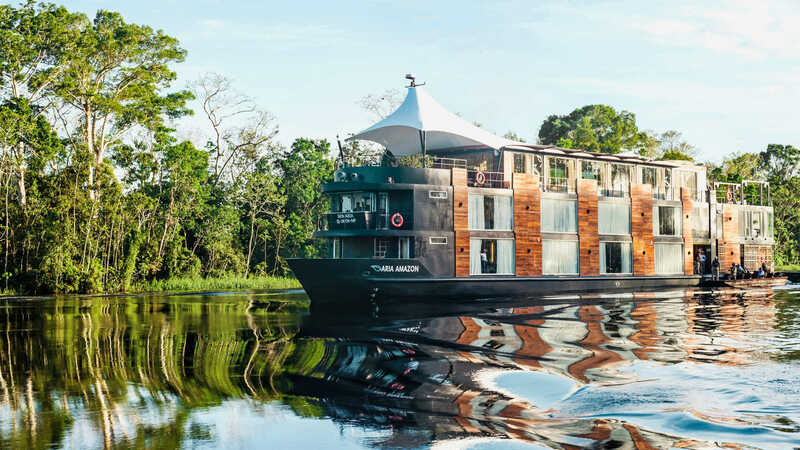 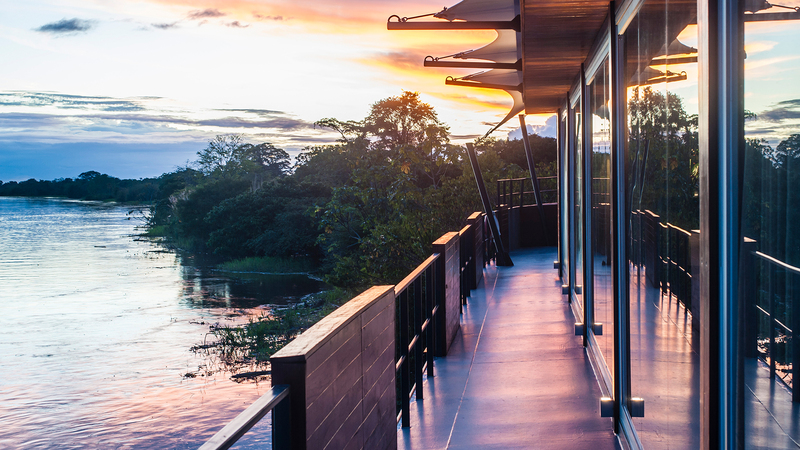 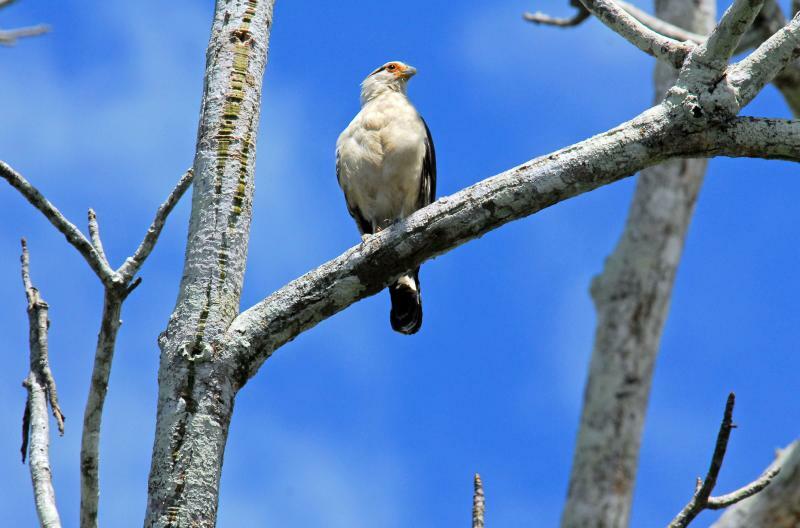 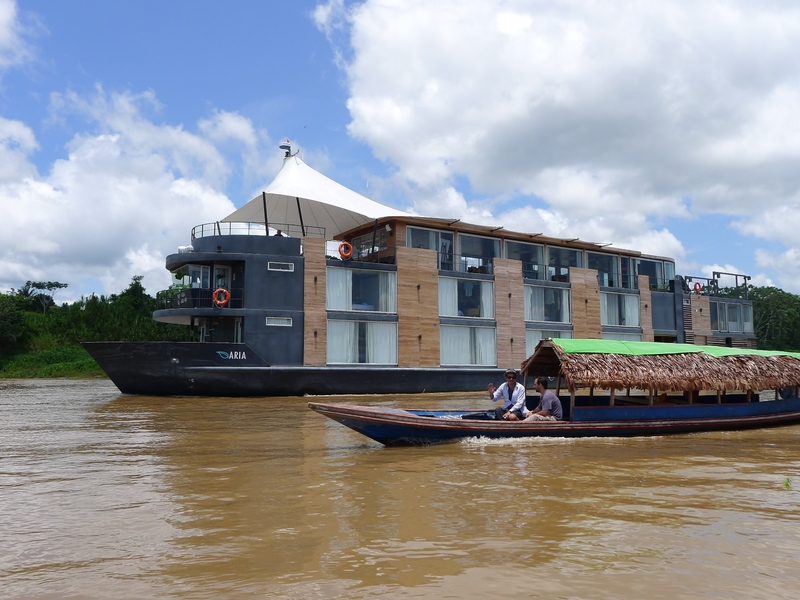 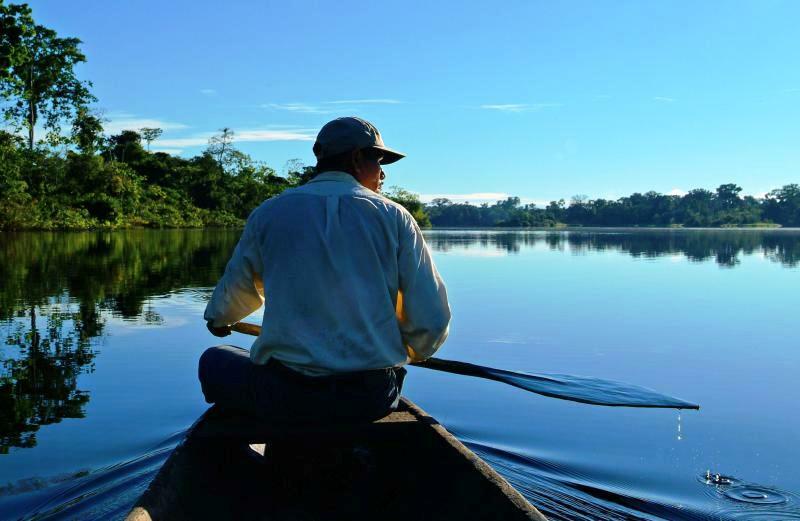 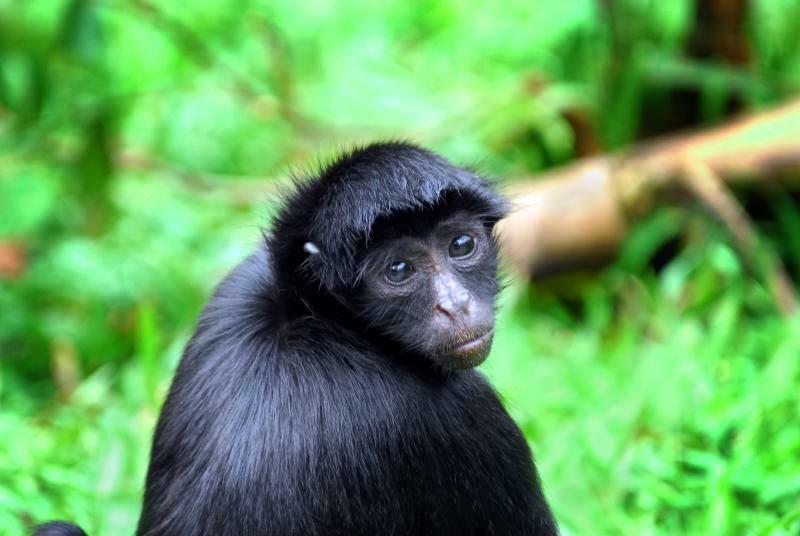 As your ship docks along the river, knowledgeable and experienced naturalists will take you, via small launches, into remote estuaries in the Peruvian rain forest and the Pacaya Samiria Reserve. 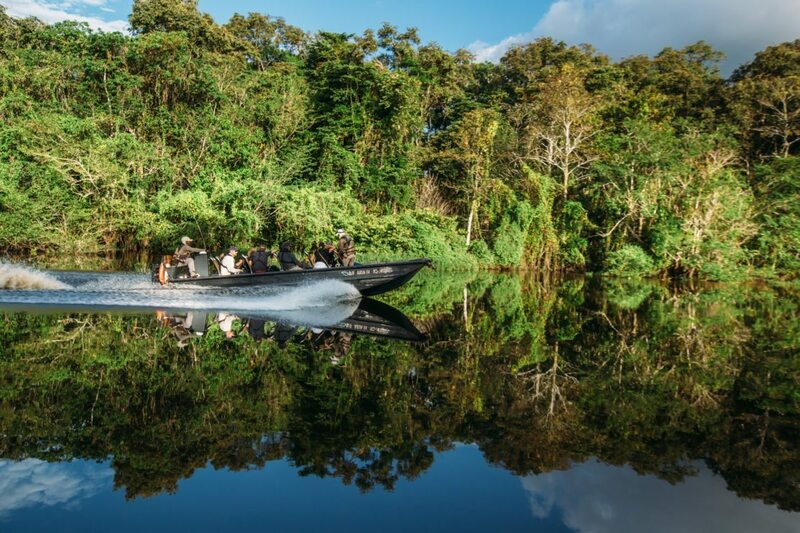 As you explore these pristine wilderness areas teeming with wildlife and amazing plant life, you will also encounter local people living in villages as they have for centuries. 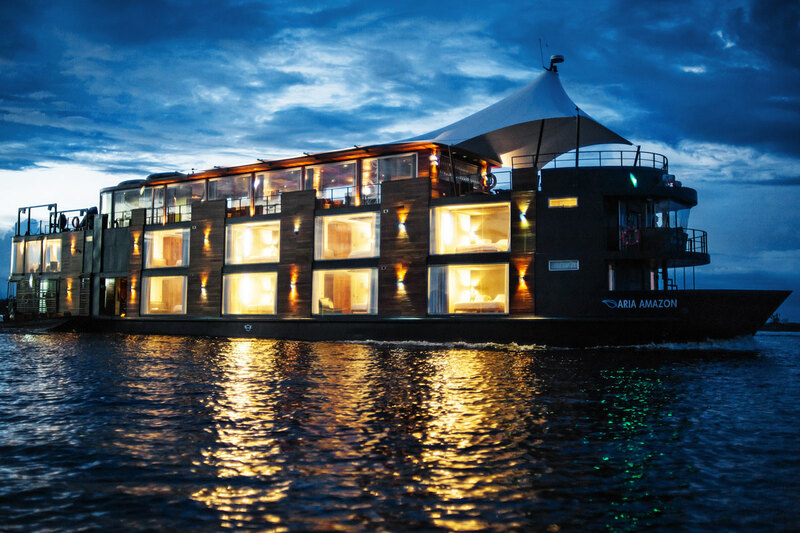 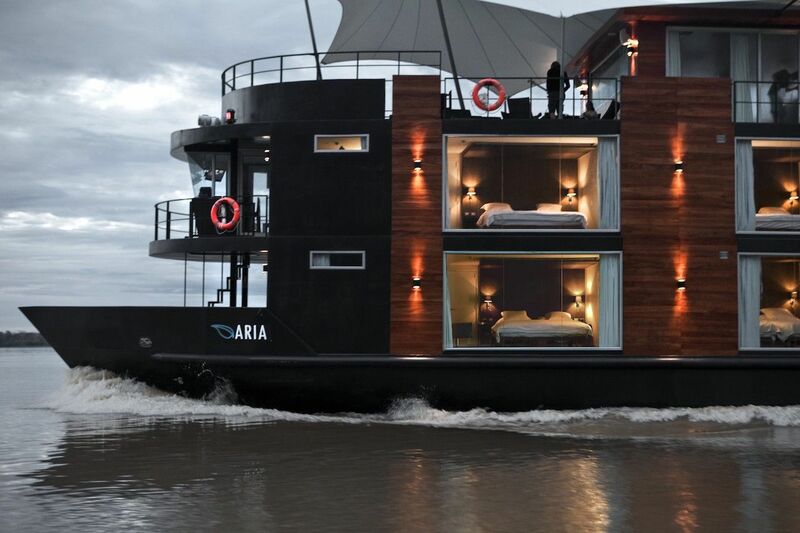 And when the day’s sightseeing is over, the comforts of your luxurious floating hotel will await you. 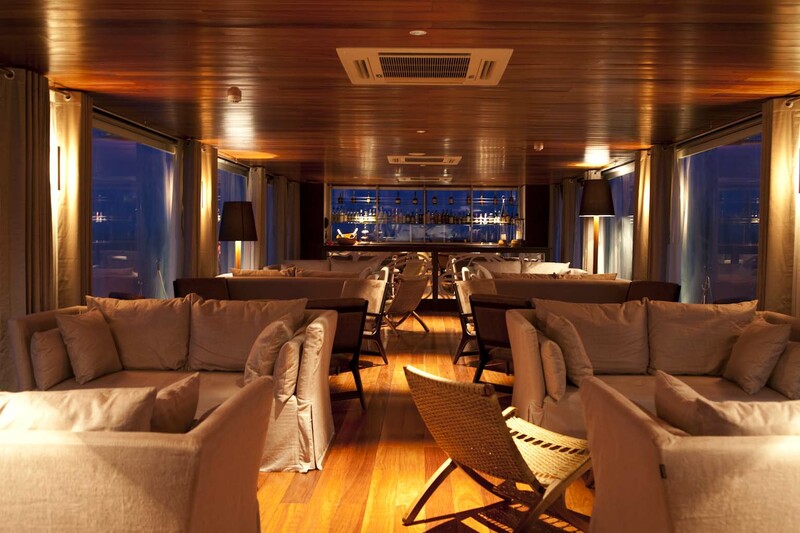 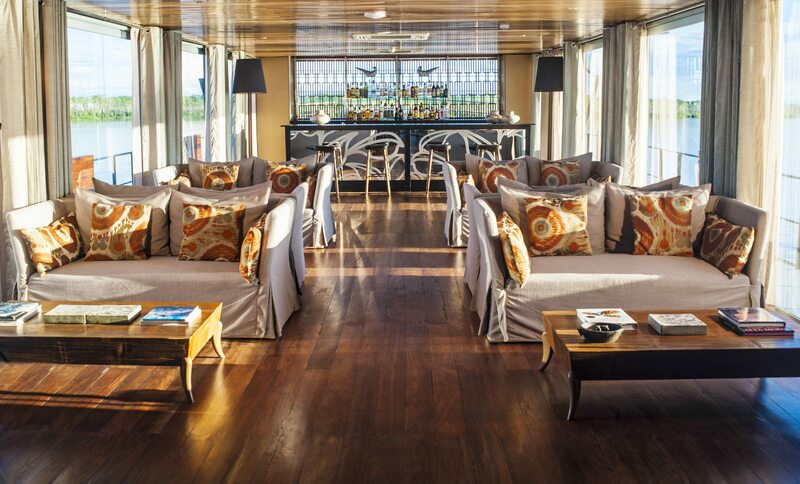 The yachts communal areas include a dinning room, Indoor Bar-Lounge, Observation Deck and Outside Lounge. 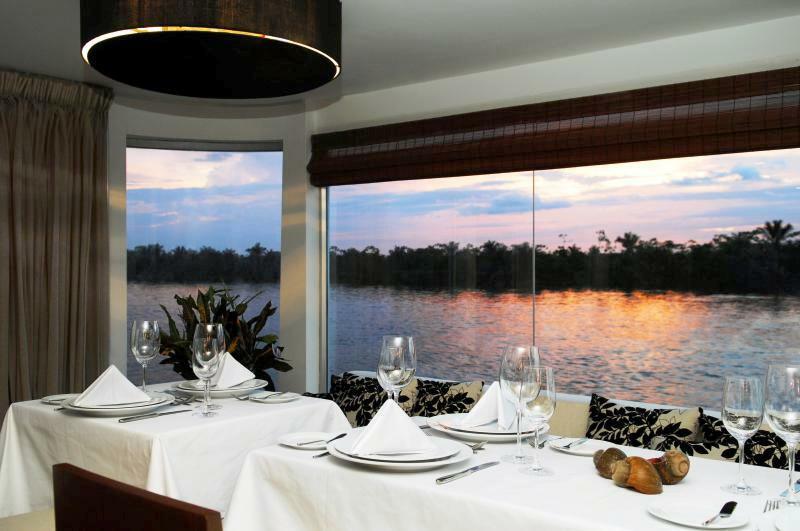 Aqua’s Dining room has panoramic views into the great wilderness. 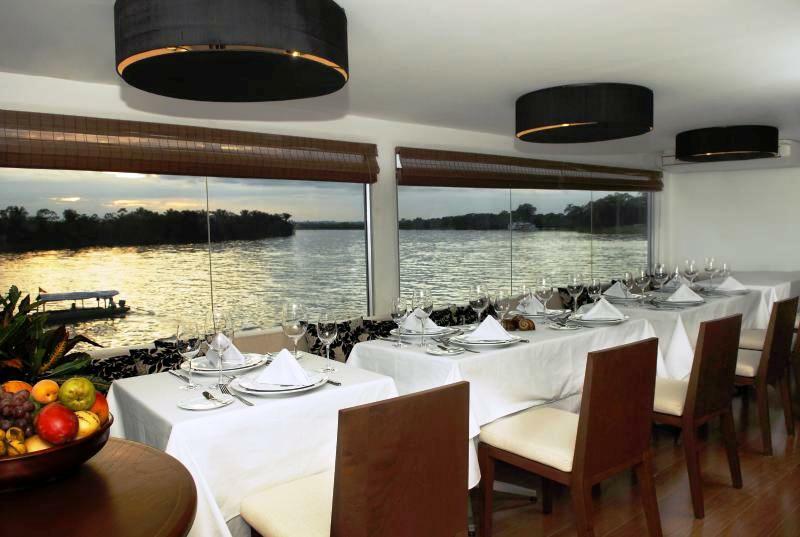 Fine china and crystal and superb service are part of the experience, similar to what you would expect from a fine dining restaurant in Lima. 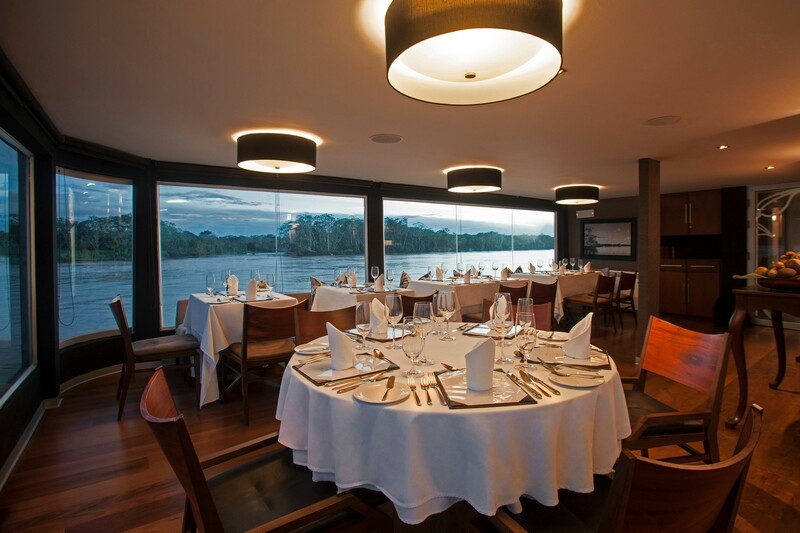 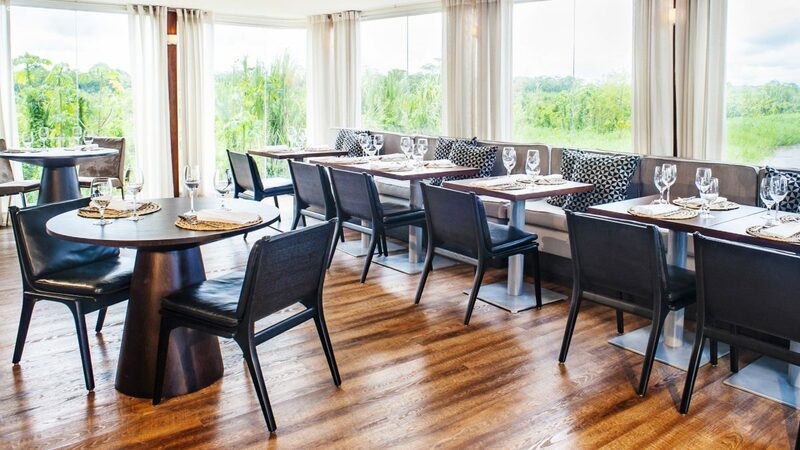 Executive chef Pedro Miguel Schiaffino, one of Lima’s culinary stars, has created a menu that draws on both Peruvian and European influence. 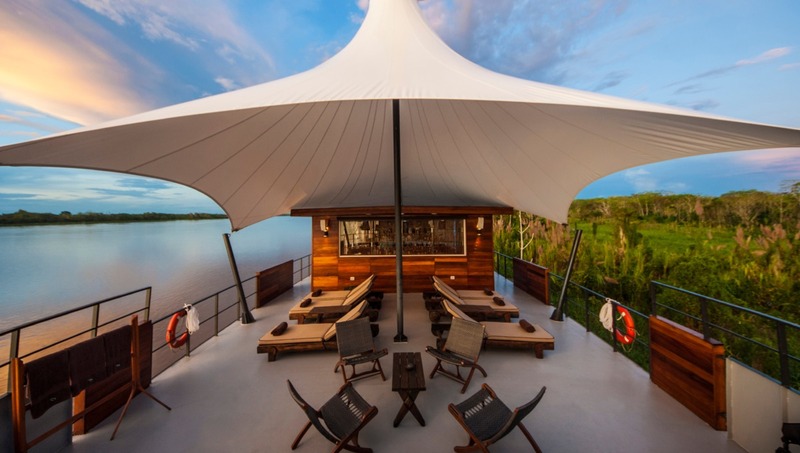 Luxury Motor vessel Aqua also has an air-conditioned indoor bar where you can relax between Amazon adventures, or enjoy a pre- or post-dinner cocktail. 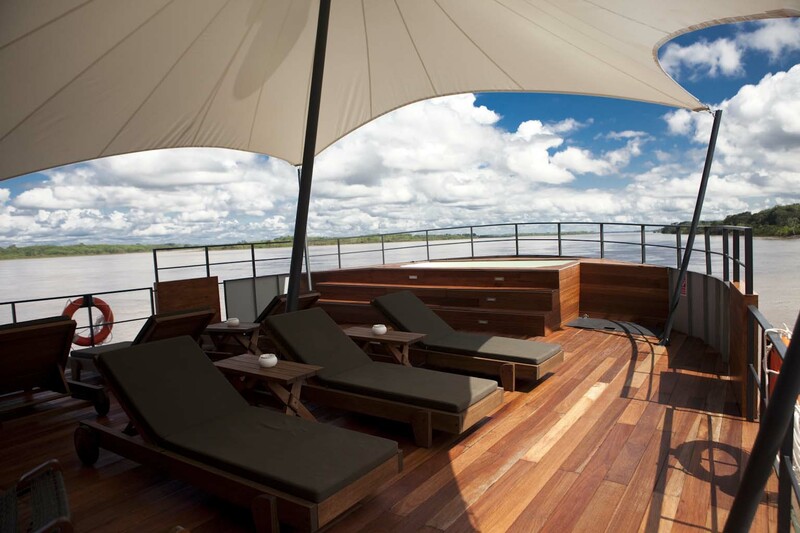 There is also plenty of outdoor space on M/V AQUA. 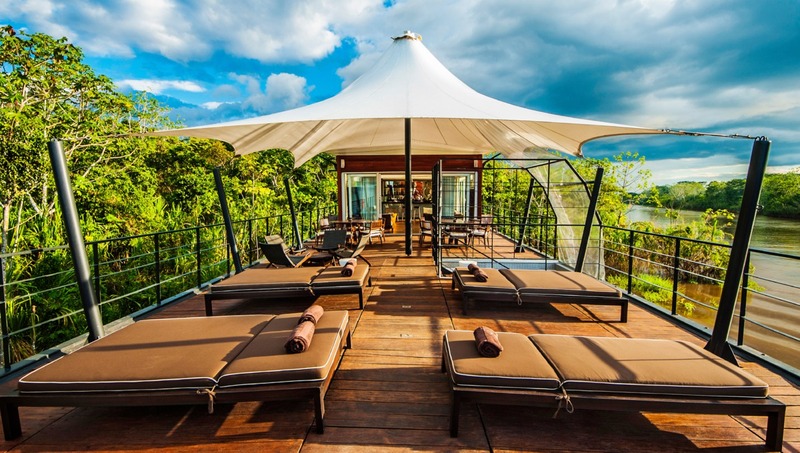 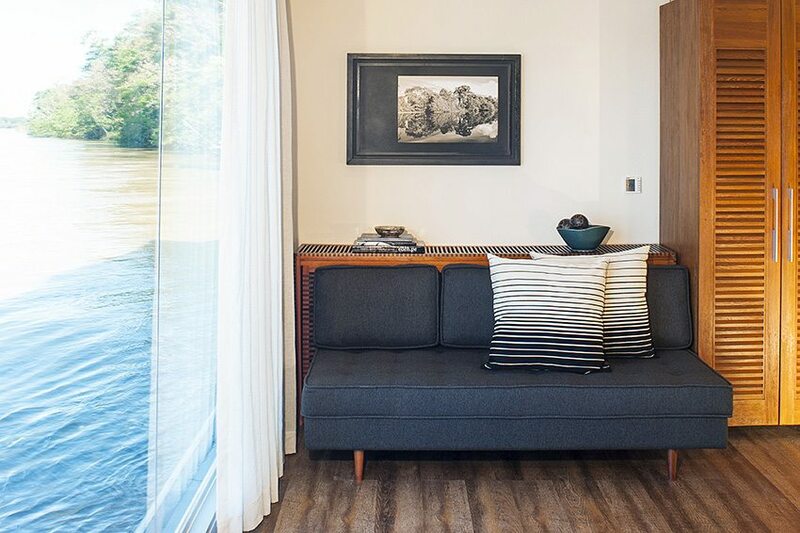 The generous top-level Observation Deck offers sunbathing, space for reading a good book, enjoying some down time after an excursion, or simply watching the river go by. 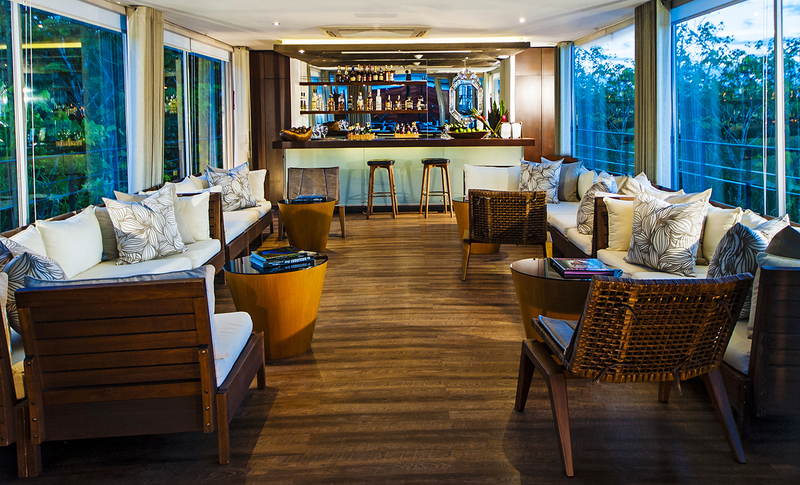 Drinks and light snacks are available in the Outdoor Lounge, perfect any time, but especially lovely at night, when you can see stars shinning down like over head lights. 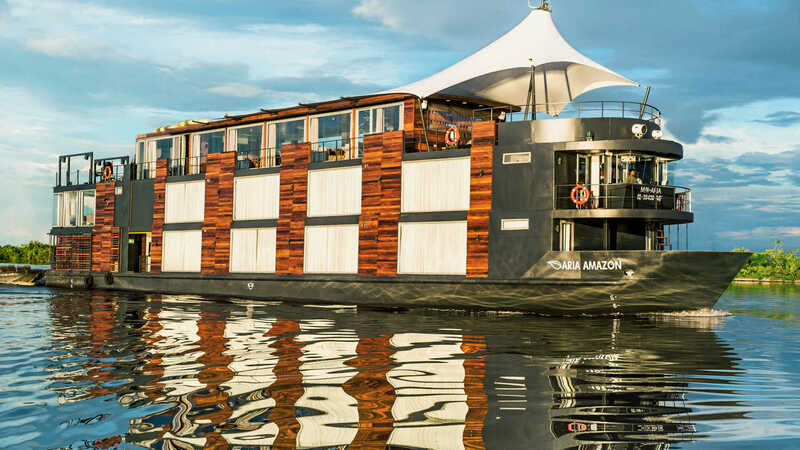 There is also a small boutique shop, located on the Second Deck, featuring a nice array of gift items from the Amazon area, as well as small items that you may have forgotten to pack. 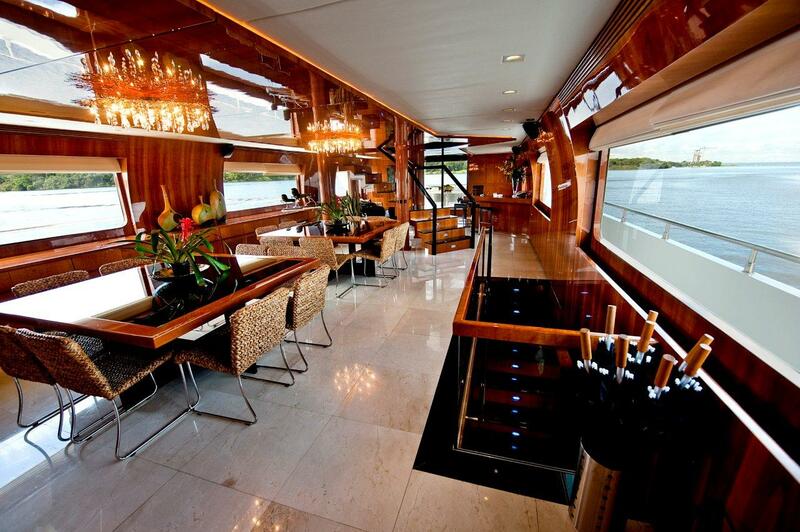 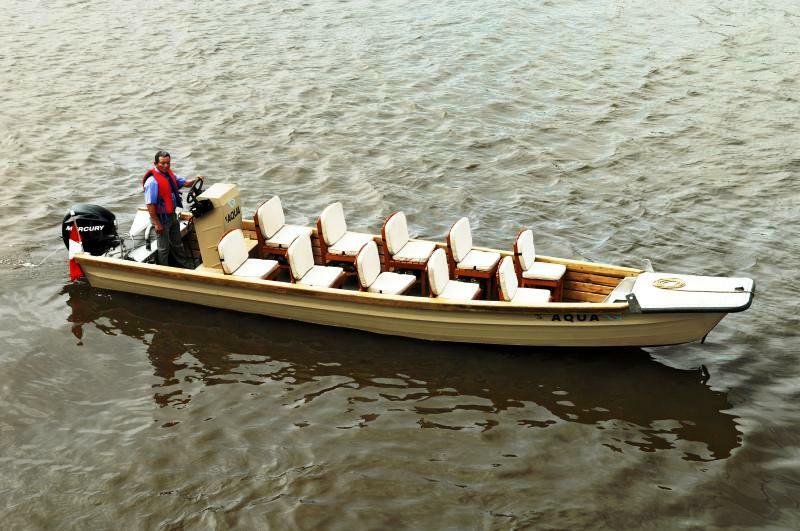 The motor Vessel AQUA can accommodate a total of 24 guests in 12 convertible suites. 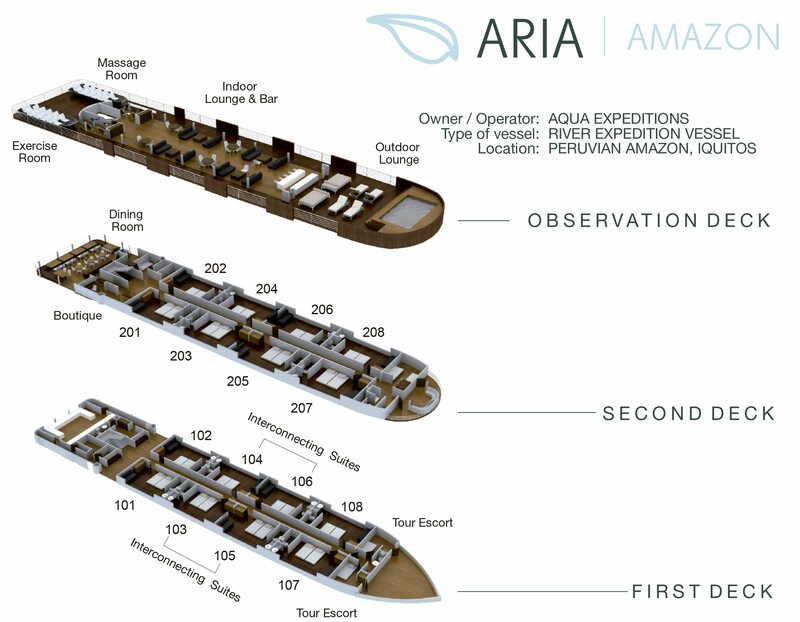 Her 4 ‘Master’ staterooms measure 240 sq. 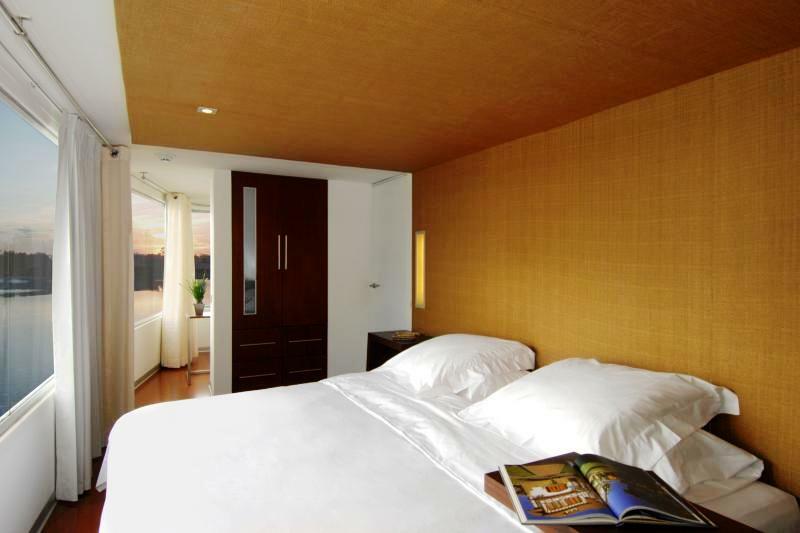 ft and have natural fiber tapestry paneling over the bed. 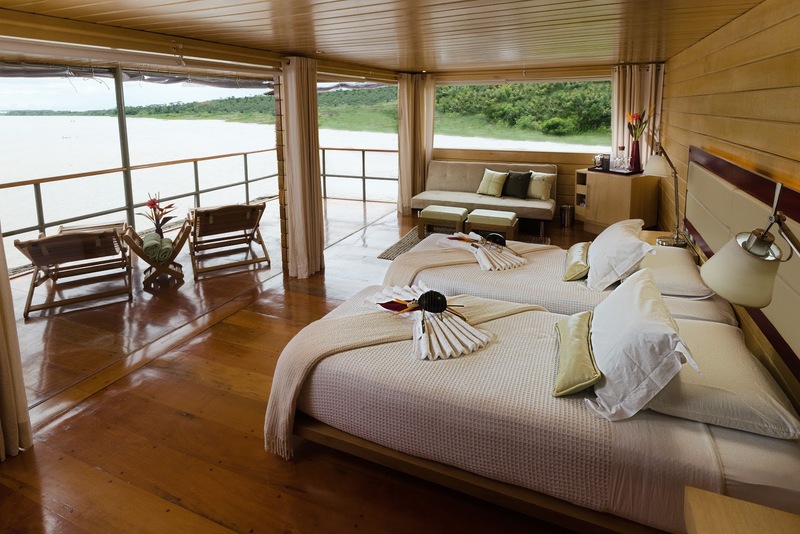 These suites have a totally separate seating area for optimum privacy. 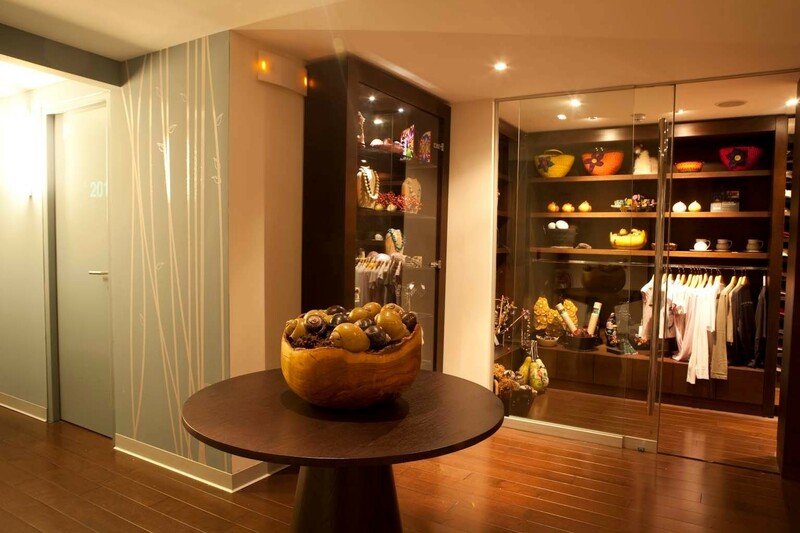 The remaining 8 suites measure 230 sq. 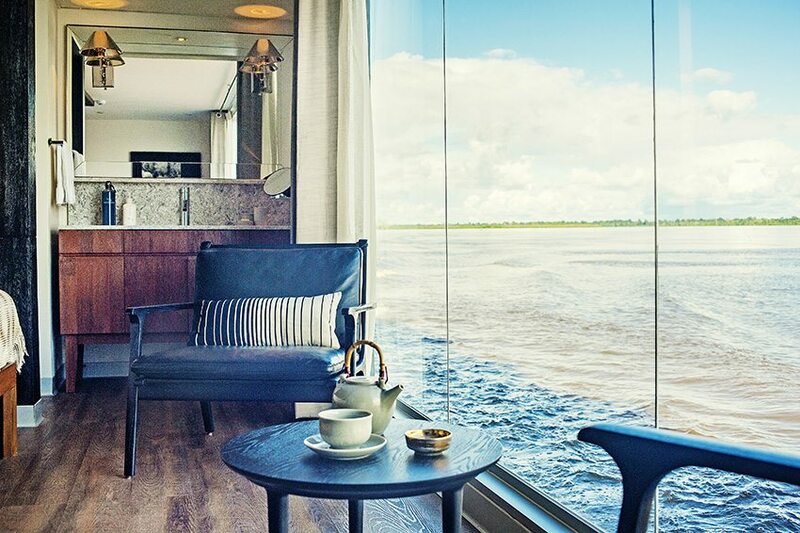 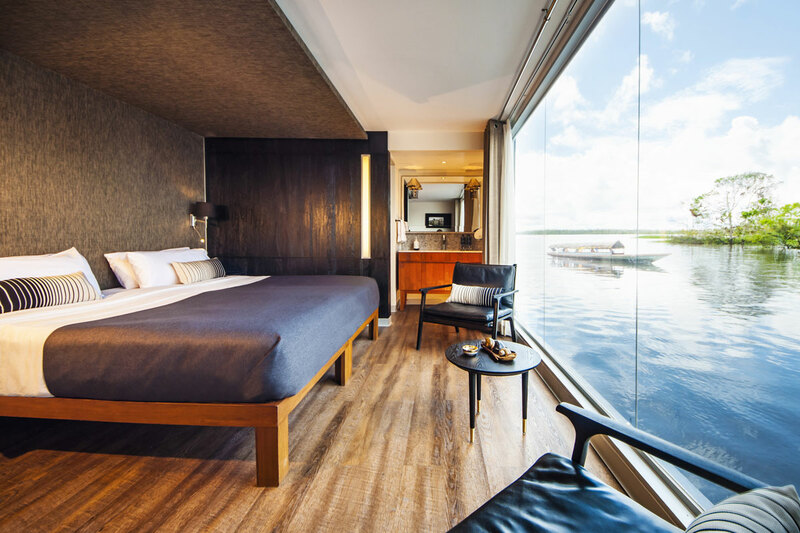 ft. All cabins are outside-facing with seating area and large panoramic windows that enable you to get the "big picture" of the rivers and their banks from the comfort of your cabin. 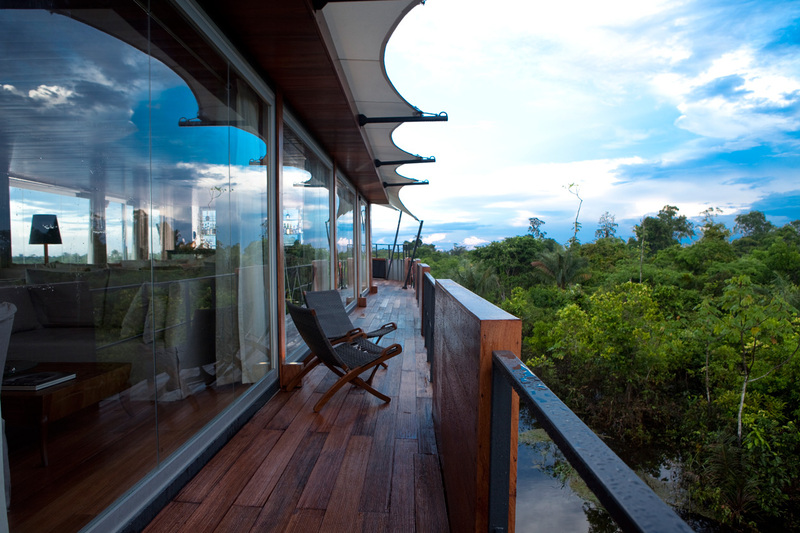 Four of the cabins are interconnecting making it ideal for families. 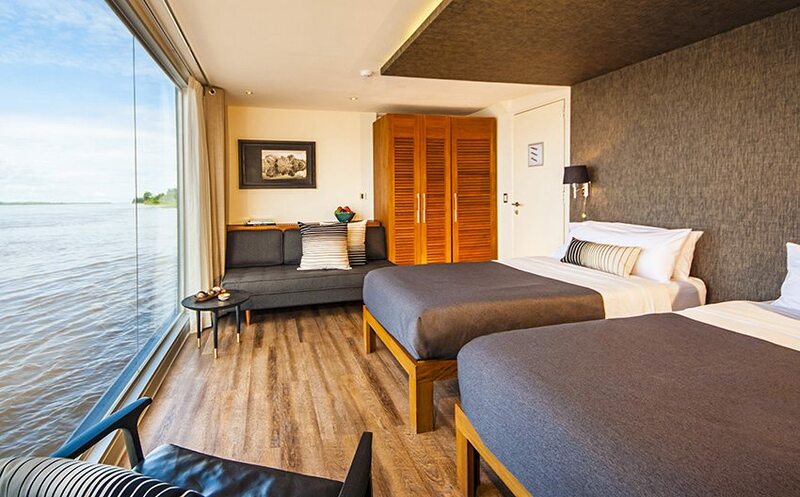 The twin beds can be converted to a California king-sized bed. 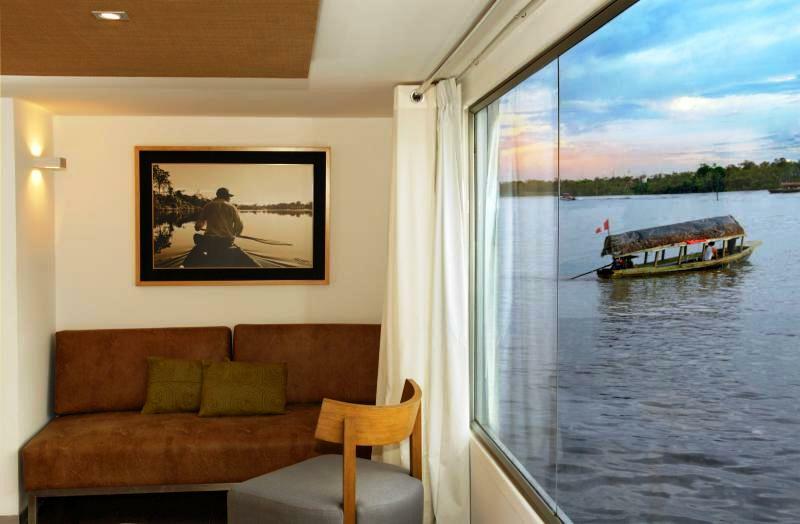 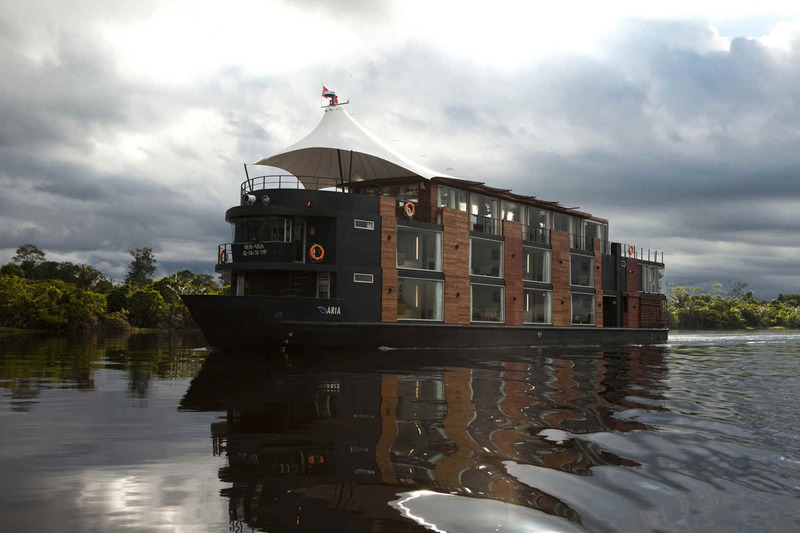 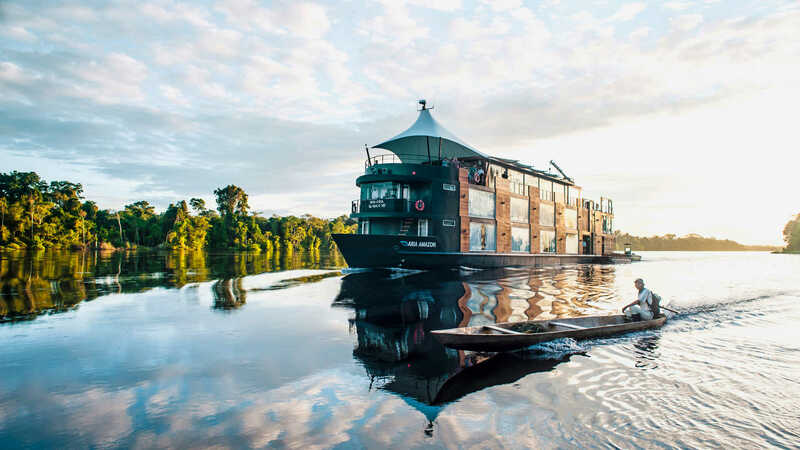 Each air-conditioned cabin has been beautifully decorated to create the feeling of a luxury lodge on the Amazon River, complete with Amazon photography by French photographer Jean Claude Constant. 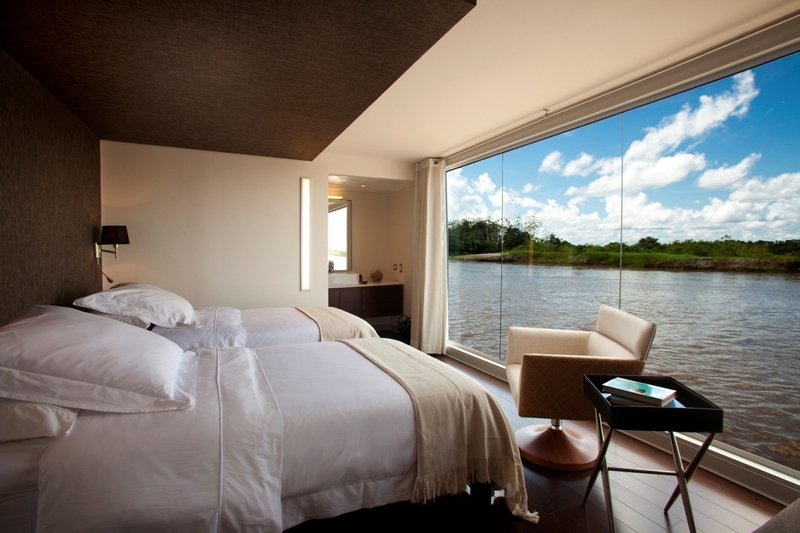 Sheets and bedspreads are 100% Peruvian cotton, with at least a 280-thread count.